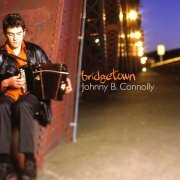 The newest accordion-playing Johnny Connolly on the Irish Music scene talks to Helene Northway about his new album "Bridgetown" and his love affair with the fiddle. The names "Johnny" and "Connolly" seem to somehow add up to "Box Player." Connemara melodeon player Johnny Connolly and his son, Johnny Og Connolly came first but Johnny B. Connolly, also known as "Johnny Box" has hit the Irish music scene with a flourish and with a little help from some very talented and well-connected friends. The 26 year-old Dublin native has been playing music since he was 8 years old. 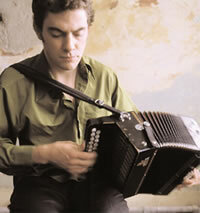 "I started playing the whistle and I didn't move onto the accordion until I was 12," explains Connolly. His mother emphasized early musical education for Johnny and his 3 sisters and, fortunately enough, another branch of the family was taking the same tact. "Tom (flute) and Eamon Doorley (fiddle) (Connolly's cousins and members of Danu) are of a similar age – Tom is two years older than me and Eamon is two years younger than me so we used to hang out a lot as kids. So not only did we see each other socially, but we had something else to share as well, which was the start of our music. It went on from there over the years into the session scenes." At 17 though, Connolly joined the Celtic ensemble Anam and spent two years honing his craft both in Dublin and touring festivals throughout Europe and Ireland with the group. "That was when Danu was taking off. We'd play together in sessions or whatever but then I went to America." Connolly still delights in playing with the Doorleys. "We still meet up all the time. They've come through Portland a couple of times and every time I go home I always hook up with them. It's great to see them and play socially like we always did. It just sort of turned out that way – the way they went and I went my way. There wasn't really any particular reason why it happened like that." Connolly's introduction to America is the stuff that stories are made of. In 1996, at the age of 21, he joined fiddler Patrick Ourceau in New York for a 4-month gig and then met guitarist Aidan Brennan in Dublin. They clicked musically in the Dublin sessions and then, in 1997, Connelly made a fateful decision. "Things were a little bit slow," he explains, "I thought the Dublin scene was a bit sluggish. Aiden was talking about going back to Portland (Oregon, where Brennan previously lived) for a while and I decided to go with him. He talked very highly of the scene and I just went out to give it a try. I came out on a 6–month ticket and I'm still here 5 years later. It was a good move – it's one of the best moves that I've made. That's where I got to meet Kevin and there's been a lot of well–known Irish musicians who've lived there for a period of time." The "Kevin" of the story is legendary fiddler Kevin Burke of Bothy Band, Patrick Street, House Band and Celtic Fiddle Festival fame and a staple of the Portland Irish music scene. And it's no coincidence that it is a fiddle player that Connolly considers one of his biggest influences. 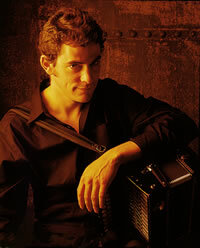 "In the last 5 or so years I've really been drawn to fiddle music. I love playing with fiddle players. I've always been drawn to the fiddle. I've been trying to almost copy a style of fiddle playing on the accordion, that's why it's been such a great experience playing with Kevin. Fiddlers Steve Larkin (from Anam) who lived in Dublin and Julie Langan (from Fonchaoi) are two of the other players that I've learned the most from." CD available from cdRoots Audio (c)(p) 2001 Green Linnet, used with the express permission of the publishers and the artist. Actually the two met playing in the Portland pubs. "I've been living in Portland for the last 5 years and Kevin has made his home there for the last 20, that's where I've gotten to know him and I've been playing with him over the last couple of years locally," explains Connolly. "Then he recorded with me on the album. He's a great character and a great person to know and an amazing musician. It's an honor to know him. Kevin and Ged (Foley) have been playing together for years as a duo and with Patrick Street. Ged's a really good guy and a fantastic producer. I hope to get him back for my next album, which I'm going to hopefully record sometime next year." The album is Connolly's debut, the Foley produced Bridgetown (Green Linnet). The title is in homage to his adopted home. Joining he and Burke are Brennan and Portland locals Skip Parente (viola and cello) and Jim Chapman (bouzouki). Portland and Burke have obviously had a huge influence on Connolly as a musician. "There is a very good scene even though it's small compared to other cities. If you go to Boston and New York and Chicago, the scenes are bigger and there are more players but we have a nice scene. There are 3 or 4 pubs and bars that have regular music during the week and mostly on the weekends. I've been lucky in that, before I embarked on this whole Green Linnet venture and doing this album, I've been playing in Portland for the last two years and making my living solely off music. Which has been brilliant!" "Once you get to Portland you understand why it's so popular," says Connolly who could work for the local tourist board. "It's very apparent to me. It's such an easy place to live. It has a very temperate climate – it never gets too cold or extremely hot. It has cheap rent and you can get by and have a pretty nice standard of living without having to do a whole lot. That is very attractive. Kevin got stranded there during the 70's when there was a huge gas shortage and ended up really liking it and settling there as well." These days, Connolly is sorting out ideas for his follow-up album, that he hopes to come out with next year. "I'm trying to gather ideas. I don't think it'll veer too far away from the first one, but I have some definite ideas that I'm thinking about. I think I'll maybe be a little more adventurous so we'll see what happens." This article originally appeared in print in Irish Music Magazine.